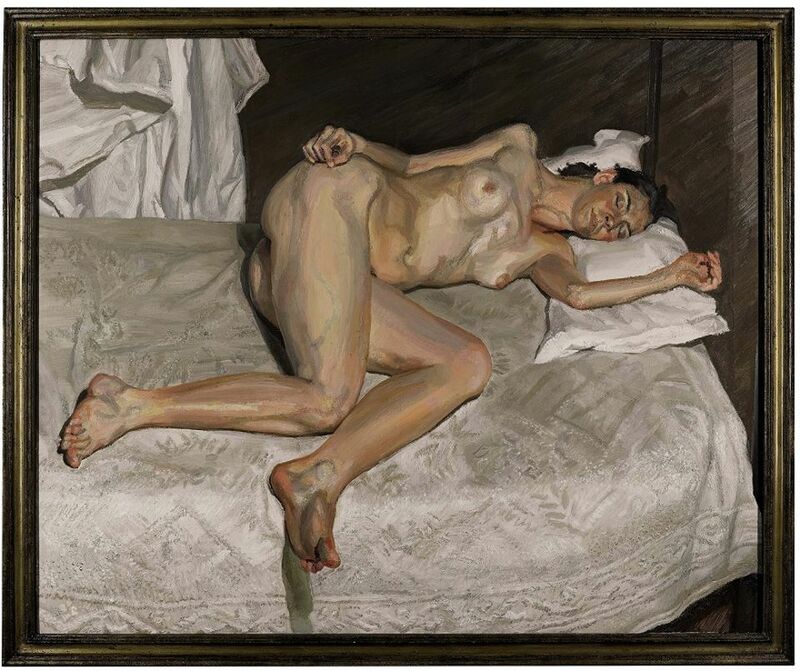 One of the last reclining nudes that Lucian Freud painted achieved £19.7m (£22.5m with fees) at Sotheby’s last night, making it the most expensive painting by the artist to be sold in London. The strikingly composed Portrait on a White Cover (2002-03) saw bidding from Freud’s dealer, Acquavella Galleries, and Patti Wong, the chairman of Sotheby’s Asia, before selling on the phone to Alex Branczic, the auction house’s head of contemporary art in Europe. The canvas was one of 25 guaranteed works in the 44-lot sale, which racked up £94.2m (£110.2m with fees) in total, against an estimate of £79.7m-£108.2m. The result is now the fourth highest for Freud, whose record stands at $56.2m (£36m) for Benefits Supervisor Resting (1994), which was bought by the Russian oligarch and owner of Chelsea football club Roman Abramovich at Christie’s in New York in 2015. The painting, which Freud began when he was 80, is of Sophie Lawrence, a little-known sitter whom the artist met when she worked as a cataloguer for the Tate, where Freud had a retrospective in 2002. The pair hit it off, “drinking champagne and gossiping” in his garden, according to The Telegraph.